It's too easy to get trapped in your own world in New York City, especially when the weather is colder and you find yourself rushing from place to place. As it slowly begins to get warmer and locals begin wandering a little bit farther from their homes and offices, it's important to remember to look around. Walk a different route, take side streets, you'll be surprised by things you might not have noticed before. While 42nd Street has a mythos of its own, our neighboring 40th Street holds a lot of secret treasures too. Take a look below at some of the architectural gems to be found just to our south. Commissioned by Andrew Carnegie for the country's first engineering social club, The Engineering Society. It features Renaissance revival style making use of white marble and red brick embellished with marble cornerstones, molded window enframements, and cornice. An early example of the high-rise clubhouse building type. 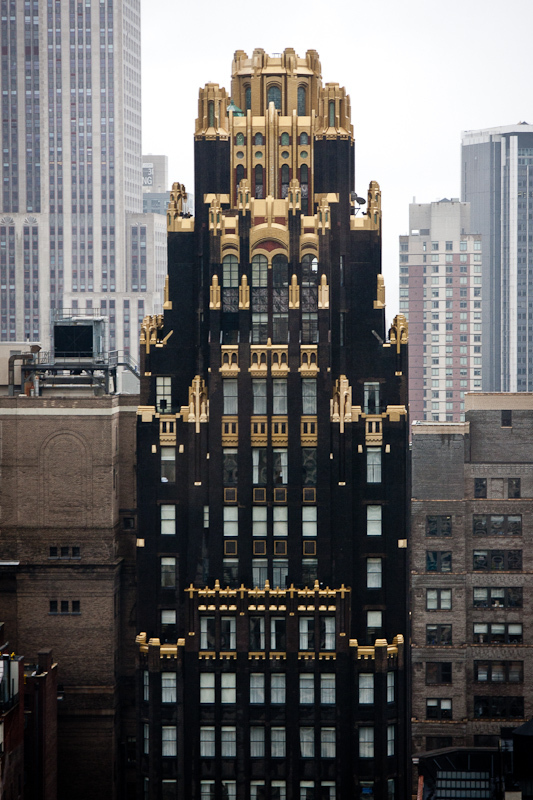 Landmarked by the National Register of Historic Places in 2007, The building is now part of Bryant Park Place, a co-op unit consisting of the only permanent residences on the Park. Nicola Tesla was a member of the club and the southwest intersection of the park is named for him. Photo: Emilo Guerra. Built for the American Radiator Company, this Neo-Gothic treasure features black brickwork and gold leaf embellishes such as a series of figures that anthropomorphize the transformation of matter into energy. This high rise was meant to resemble it's anchor tenant's signature product, the radiator, with black brick representing coal. 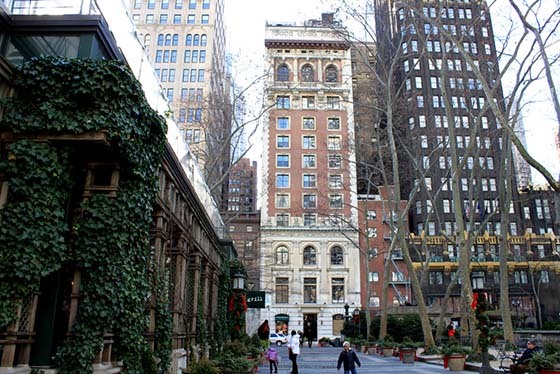 Recently converted into the Bryant Park Hotel. Looking south from the park, this tall building visually complements the flashy art-deco Empire State Building a few blocks down. Photo: Forgotten New York. Commissioned by Colonel Abraham A. Anderson, a portraitist who in looking for a new studio space in the city, was inspired by his time in Paris and requested a building that captures that city's appreciation for northern light. 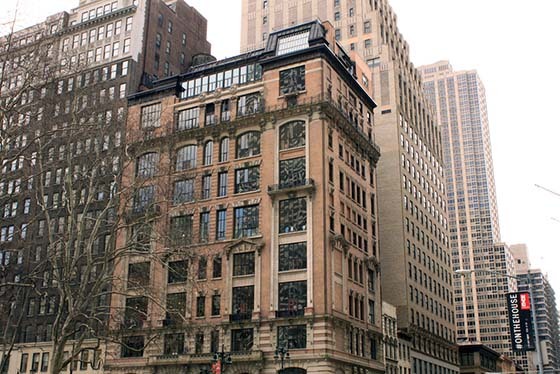 Featuring large north-facing loft windows, the building utilizes an elaborate French Beaux Arts-style. The light exposure was perfectly suited for its original use as artists studios, as well as its current use as work space for clothing designers and stylists. The Studios are currently anchored by womenswear outfitters, Alice + Olivia. The new kid on the block, 7 Bryant Park sits just diagonal to the park across 6th Ave and 40th Street. Gesturing to the park's prominence in the neighborhood, the mid-rise building features two convex cut out's lit-up and angled north-east towards the park. Combined with a set back building entrance and canopy, the structure serves as a visual extension of the park's philosophy of public space. This recently opened beauty is a nice reprieve from the uninspired office park building style of the past. 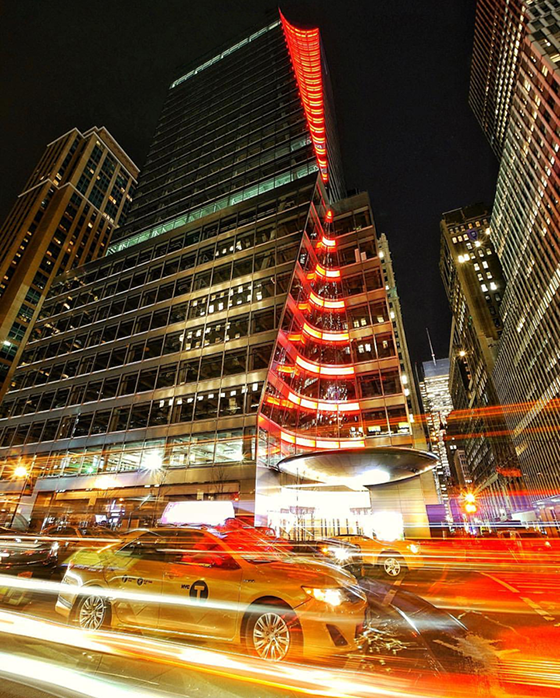 The building often uses its exterior lighting to celebrate different holidays and celebrations, though it regularly glows red for its anchor tenant, The Bank of China. Photo: Paul Gomango. Next time you find yourself taking a stroll through Midtown, wander a bit from the main thoroughfares and you might find some surprising relics.